Lipotype offers unique lipid analysis services from organelles, microorganisms, cultured cells to tissues and organs. The advantages are such as broad coverage of lipids (>2300 absolutely quantified lipids), small sample amounts (e.g. 100.000 cells), two weeks delivery time of results, comprehensive statistical analysis and graphical presentation of data. Lipotype uses Shotgun Lipidomics Technology without time-consuming chromatographic separation of lipids before analysis. We utilize the advantages of cutting-edge mass spectrometry, combined with automated sample extraction, processing and data analysis. In this way, our exquisitely standardized platform allows for the analysis of hundreds of samples per day, offering unprecedented delivery time of weeks instead months for complete results and associated reports. The quantification is achieved using lipid class-specific internal standards that allow for unbiased and direct quantitation of individual lipids directly from their mass spectra intensities. Therefore, we deliver results expressed in absolute and not in relative values, which provides the basis for a direct comparison of different samples and experiments. Lipotype Shotgun Lipidomics Technology is highly reproducible1, 2, robust and reliable. This performance is ensured by a rigorous quality control system. The high standards of Lipotype operations are based on years of research experience on lipids and lipidomics technology. This is reflected in numerous scientific publications from different fields, as well as in industry-oriented applications and patents. Lipotype uses proprietary software for lipid identification: LipotypeXplorer. 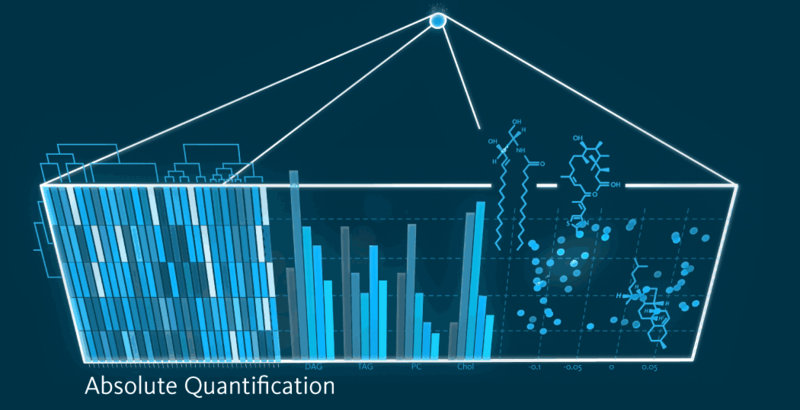 With the molecular fragmentation query language (MFQL) it identifies lipids with high precision and without bias. LipotypeXplorer does not rely on predefined databases, which have to be curated and maintained and which might not be complete. Lipidomes have an inherent structure (e.g. lipid classes and fatty acid saturation) that is accessed by multiple layers of dynamic aggregation. With Lipotype Zoom your data can be viewed and downloaded in graphs, heat maps and principle component analysis plots. Moreover, our advanced statistical reports supply you with customized cohort comparisons, correlation and pathway enrichment analyses. We empower you to interpret your data to always be one step ahead. We are scientists too, and we know that with each experiment new queries pop up. And as we are experts in membrane and lipid biology and chemistry, mass spectrometry, and bioinformatics originating from the world-renowned Max Planck Institute of Molecular Cell Biology and Genetics in Dresden, Germany, you can benefit from our experience in lipidomics and cell biology as well as bioinformatics by means of personal consultations from sample preparation to interpretation of results. Lipotype Shotgun Lipidomics is a high-throughput lipid analysis. The decreased processing time and increased sample numbers together with small samples amounts required for an analysis, turn into a cost advantage for you. We want you to profit from our innovation by offering reasonable prices that make lipidomics an affordable tool in your research projects.